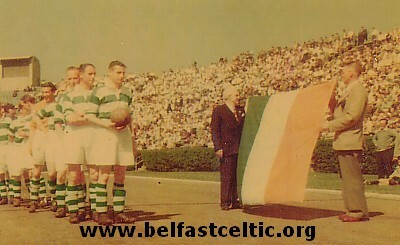 Publication in the Belfast Evening Telegraph of a photograph showing the Belfast Celtics soccer club marching behind the Irish Republic flag in the opening game of their US Tour at Randall's Island Stadium several weeks ago may lead to a resumption of the Battle of the Boyne when the Celtics, who sail Tuesday arrive back home. Unless the Celtics' brilliant victory over the Scottish Internationals at Randalls Island May 29 has changed the situation and made heroes out of the team, Orangemen's Day, July 12, promises to send the two factions in Ulster's perennial religious-political war at each others' throats in an old-fashioned Dennybrook that can be traced to the Randalls Island incident. "Foreigners," i.e., non-Irish folk, will understand the situation better if they are reminded that the North of Ireland, predominantly Protestant, is still part of the British Empire whereas the Irish Republic severed the last ties with Britannia only a little over a month ago. The Irish Catholic faction in Ulster favors union with Southern Ireland. The Protestants want no part of the Republic. Hatreds based on political and religious differences have existed in Ulster for centuries and every so often lead to skull-cracking sessions that Irish-Americans of both religious groups find difficult to understand since they get along well together over here. When the Celtics opened their tour here, they received strong support from southern Irishmen although soccer is considered a "thraiterous" game in their part of the Ould Sod, where Gaelic Football is the most popular form of kicking, next to being "agin' the government." Had the Celtics paraded behind the Orange banner instead of the Republican flag that afternoon, there probably would have been a riot at Randalls Island Stadium. The Celtics, still bitter because one of their stars, Jimmy Jones, was set upon and brutally beaten by a mob after their last league game with the Linfields, the Protestant team, in Belfast last February, will withdraw from the Irish Soccer Football League when they return. Jones is still hospitalized with a broken leg and other injuries which almsot cost him his life. Since the Belfast Telegraph printed the photo of the Celtics marching behind the Republican Flag, relatives of the players have written from Belfast, telling of threats they have received and several players have been told by the firms that employed them that they needn't return. (P.S. When the Celtics play the Kamraterna team Gothenburg, Sweden, in the farewell game of their tour, the patronage of both Protestants and Catholics is solicited and fans of Jewish, Mohameddan, Buddhist and Taoist faith will also be welcomed. Manager Elisha Scott of the Celtics who flew into a rage yesterday when questioned about the Second Battle of the Boyne, will be down to earth on this occasion, seeing that no one get in on a pass).